BLOOMSBURG, PA – Last summer Bloomsburg University did away with their previous career management system called Husky Career Link to make way for a new career management system, Handshake. Handshake is an online platform, designed to connect students to career opportunities, student services, and events found on campus. Bloomsburg students will be able to sign-up for career and development workshops on Handshake. 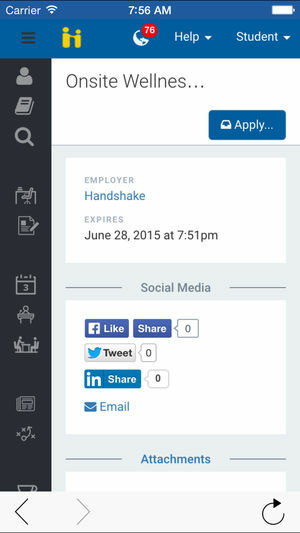 In addition, If interested in a job or internship found through handshake, students can now connect to the employer directly to get any questions that need to be answered in order to make a decision on whether or not to apply for this position. All students automatically have an account with Handshake. To activate your account, you can head to bloomu.joinhandshake.com and answer a few short questions. Communications Coordinator, Andrea Oneill, described the platform as having a layout, and look that is very similar to Facebook. Some things to look out for that are similar to Facebook are notifications and profile pages. There are also toolkits that will help with many different things. The tools range from what one may need in a professional career to writing a resume and preparing for an interview.